Our pre-school programme will help your child fall in love with learning for the first time. At pre-school level, your child will make friends, have fun and begin to pick up some of the first building blocks of learning. 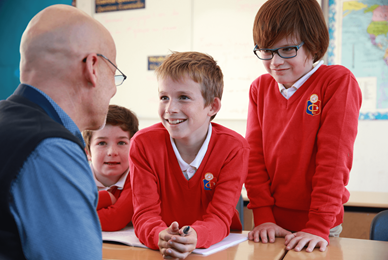 Our small class sizes of 18 or less enable our teachers to give your child the support they need. We allow all children to learn at their own pace, and help to make learning exciting rather than frustrating. We offer a choice of French or English learning from three years old, depending on your preference. Reading is taught in the child's mother tongue at five years of age, but children quickly become familiar with both French and English as they experience them in their daily lives at school. We know how important it is to have a welcoming and comfortable environment for your child. We have several play areas that children can use during the day, and healthy meals can either be prepared by our chef or brought from home. Our school day features creative and fascinating projects, encouraging your child to mix with fellow students from a range of cultures and find subjects that inspire them. Our family atmosphere allows parents to keep track of how they are doing, and know they are happy and well cared for.